There have been few fighters in recent boxing memory as captivating and awe-inspiring as Vasyl Lomachenko. Every time the Ukrainian maestro takes to the ring, it’s a huge event for the sport, one which fans around the world don’t want to miss a second of. The next opportunity to witness modern day boxing greatness from the 31-year-old will fall on April 12th, when British hope Anthony Crolla will be the next challenger to contest Lomachenko’s WBA ‘Super’ and WBO lightweight titles. It’s at the Staples Center in Los Angeles, California, where Lomachenko will aim to defend his 135-pound belts again. Vasyl is considered a strong favorite at odds of -5000. Notably, the Ukrainian ace also holds the prestigious and highly-regarded Ring Magazine strap, having won it when he brilliantly dethroned Jorge Linares back in May last year. Incredibly, that victory for ‘Loma’ over the stylish and very popular Linares at the world famous Madison Square Garden in 2018 was his maiden ring outing at lightweight. His 10th-round stoppage success over the Venezuelan saw him become the fastest ever three-weight world champion, earning another slice of history in his already sublime career in the professional ranks. Lomachenko shot to prominence in a short amount of time as a professional and dazzled anyone who’s had the opportunity to view his incredible credentials up close. Bantamweight champion TJ Dillashaw, regarded as the favorite in the UFC odds to overcome Henry Cejudo before his eventual upset, was previously involved in the Ukrainian’s camp while the MMA fighter prepared for an upcoming bout in the Octagon. Whether you are a boxing fan or not, you probably dream of having a body like a professional boxer. Boxers usually have a well-chiseled chest and ab muscles as a clear indication of the hard work they put into their sport. Besides that, they are well conditioned, capable of even going toe to toe for 12 rounds of intense boxing. Many boxers, especially the most successful ones, don’t dwell on power alone; they also rely on speedy handwork and footwork to bamboozle their opponents. So, the question becomes: how can you get yourself a body like one? Here is an in-depth guide that’ll take you through how to train like a pro boxer. Most exercises in this list will be bodyweight exercises, meaning you won’t need a gym to practice – only yourself and some space. Burpees are an excellent option for strength and conditioning training. With burpees, you work all the major muscle groups in your body. Stand upright with your feet some distance apart for better stability. Quickly switch to a squatting position. Once in a squatting position, throw your feet back and get into a plank. Return to the squat and jump as high as you possibly can. You can add a few twists such as do two squats instead of one or do a sideways lateral jump rather than jumping straight up. Classic heavyweight boxing matches are few and far between these days. Sure, there have been some fights that have been hyped to death, like Anthony Joshua vs Joseph Parker, but they ultimately fell flat in the ring. Even Joshua vs Klitschko, the fight the Ring Magazine called “arguably the best heavyweight championship fight in 20 years”, said more about the travails of the heavyweight division over the last two decades than the bout itself. It was good. Perhaps, very good. But was it great? 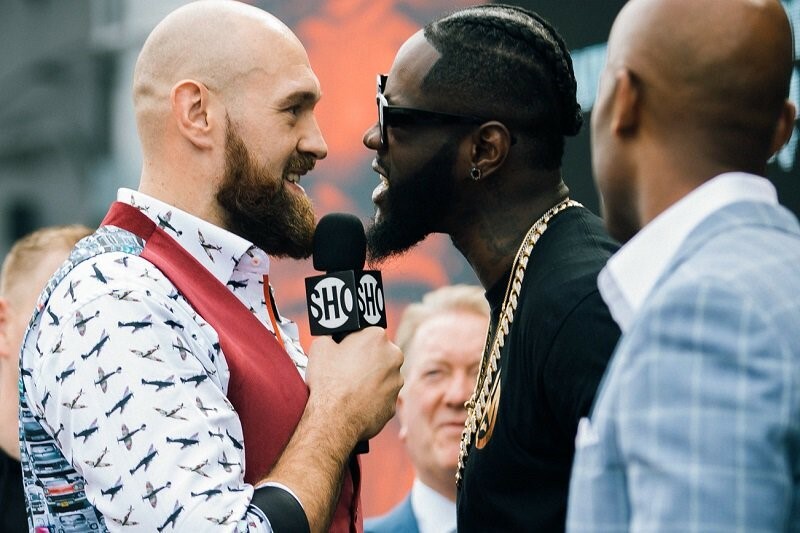 On December 1st at the Staples Center, Las Vegas, Deontay Wilder (40-0, 39 KOs) will put his WBC Heavyweight title on the line against Tyson Fury (27-0, 19 KOs). The build-up has been uncharacteristically muted, especially when you consider Fury’s uncanny ability to steal the headlines. However, with just a few weeks to the fight, don’t put it past the Brit to do something in the vein of Conor McGregor to make sure the limelight is firmly on himself and Wilder before the bell rings. Where was the actual controversy in the Golovkin/Alvarez scoring? The 118-110 scorecard by Adelaide Byrd on behalf of Canelo Alvarez has circulated throughout the Internet and the media as an egregious disaster, but does she deserve as much controversy as she has received? Perhaps, but another scorecard issue was overlooked…. Editor note: This is a guest editorial by Thomas Matthews of Oddschecker. Oddschecker are the leading odds comparison site, comparing markets across all major bookmakers to find the best odds. Gennady Golovkin vs. Canelo Alvarez has the potential to rival the Joshua/Klitschko bout in April for fight of the year. The heavy hitters from Kazakhstan and Mexico respectively will go at it and most are tipping it to be a thrilling fight as opposed to the “spectacle” that was Floyd Mayweather vs. Conor McGregor last month. But given the nature of this contest, the betting and subsequent interest in the fight has been alarmingly non-existent compared to last month’s. Oddschecker have seen an incredible disparity in the number of total bets placed, with 3,500 so far on Canelo vs. GGG compared with over 130,000 on the Mayweather McGregor show. 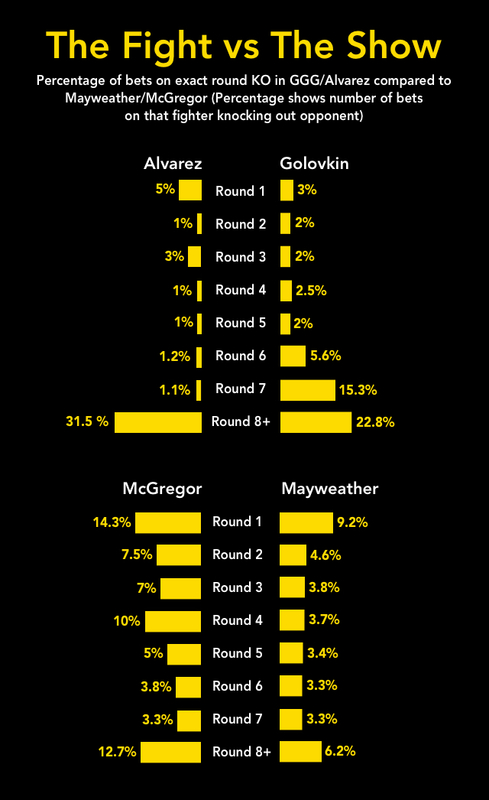 The round-by-round betting comparisons also give an indication of how punters are expecting the fight to go. A total of 54.3% of bets on Saturday’s fight have been on the match to be decided in round eight or further, compared with just 18.9% in Mayweather McGregor. Whenever a big fight comes around, it gets people talking about which fights they think are the best of all time. It’s an age-old debate and mostly it is based on what bouts people have actually witnessed in their own lifetime but some go down in history for a number of reasons. Sometimes you hear fights being billed as the biggest and best of all time, before they actually take place, and that’s where we’re going to begin. The highest grossing boxing fight of all time took place last month between Floyd Mayweather and Conor McGregor, with over $500 million generated in PPV sales alone. It was a contest which saw one of the greatest boxers of this generation take on a UFC star making his debut in the ring. It wasn’t a great fight as Mayweather just picked McGregor off to cruise to victory, but it was one thing though, extremely over hyped. The best fights aren’t necessarily the top grossing bouts. 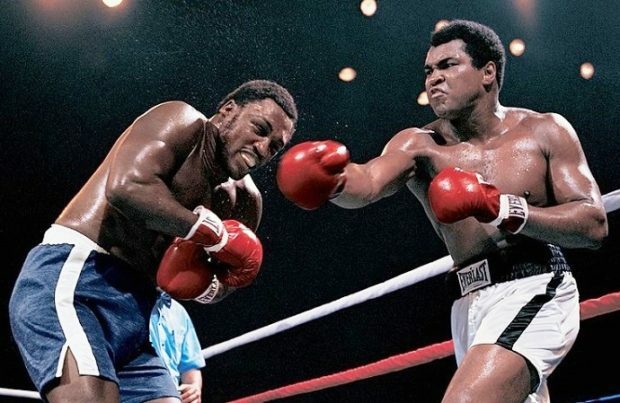 One clash that every boxing fan will have heard of is the 1971 bout between two undefeated heavyweight champions, Joe Frazier and Muhammad Ali. There was a huge amount of hype surrounding the fight but it definitely lived up to expectations with Frazier coming out on top in the 15 round match up after putting Ali on the canvas twice. On Saturday, August 26, the T-Mobile Arena in Las Vegas will host one of the most hyped-up events of all time. Floyd Mayweather, who retired from boxing but boasts a 49-0 record, will be taking on two-weight UFC champion Conor McGregor in a sanctioned boxing match. 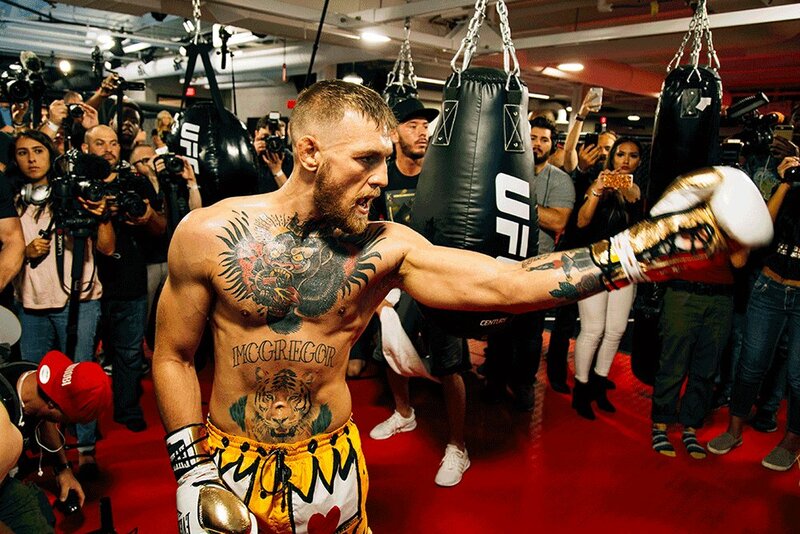 This will be McGregor’s first ever meaningful boxing match, and without any of his mixed martial arts credentials on the line and a huge payday guaranteed, it could be said that the Irishman hasn’t got anything to lose. Mayweather, on the other hand, will be putting his untarnished record on the line, as well as boxing’s reputation – to an extent. Sure he’s 40 years old and retired, but Floyd Mayweather will be taking on someone without a boxing record. Considered to be a great of the sport, a Mayweather loss would raise the standing of mixed martial arts above that of boxing in the eyes of many. Mayweather needs to win this fight far more than McGregor does, and he’s expected to do so, but what can he expect from his upcoming opponent? Many fighters, regardless of which sport they’re taking part in, will predict a round of victory during the build-up. This may be because they want to psych out their opponent and get that round in their head, or because they want their prediction to come true to receive praise from the press. In any case, they have no real way of knowing as anything can happen in the ring. Conversely, McGregor’s claim does hold some value. Floyd Mayweather has never been defeated, never been knocked out, and has only been officially knocked down in a fight on one occasion. To add to that, the American’s last seven fights – all in Las Vegas, all wins – were decided by the judges, with only two of them not being unanimous decisions. If McGregor wants to win, he needs to knock out Mayweather. Not only does he need to knock him out, but the Irishman should aim to do it quickly. As the fight progresses, Mayweather will simply get more comfortable up against the ropes and on the backfoot, bobbing and weaving, dodging the swings, and landing swift counter punches. It seems extremely unlikely that McGregor could defeat Mayweather in the eyes of the Las Vegas judges unless his knockout attempts achieve enough knockdowns to sway favor. How Can Conor McGregor Defeat Floyd Mayweather? As one would naturally assume, Floyd Mayweather – the former boxing world champion with a 49-0 record – is favored to defeat the two-weight UFC champion, Conor McGregor. Mayweather has years of boxing experience under his belt, and his defensive tactics have rendered him undefeated, whereas McGregor has never engaged in a meaningful boxing match. So, with all of the odds stacked against him, how can the mixed martial arts star, Conor McGregor, defeat retired boxer-turned-promoter Floyd Mayweather in a sanctioned boxing match? Of course, if any fighter gets the right swing connecting with the right point, it can result in a knockout. However, Floyd Mayweather – who is hailed by many as one of the greatest boxers of his weight-class – hasn’t knocked an opponent out since Victor Ortiz in 2011. 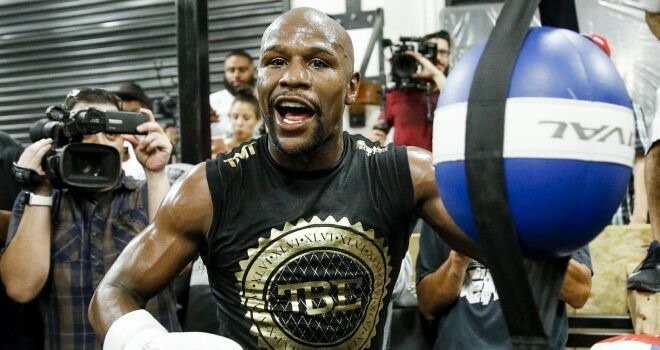 Now, Mayweather has always utilized his defensive abilities to defeat opponents, but towards the end of his career, those skills became the center of his game plan. Against Manny Pacquiao, the Filipino threw in an inordinate number of punches, and yet Mayweather’s defense managed to fend many of them off – with the American winning by unanimous decision in his second home, Las Vegas. Speaking of his second home, the last time that Mayweather fought outside of Las Vegas was in 2005, against Sharmba Mitchell in Portland. 12 of Mayweather’s last 14 fights – all in Las Vegas – have been decided by decision, with only the Ricky Hatton and Ortiz fights ending with a knockout.